When news surfaced last December that China and Thailand were exploring the possibility of setting up a new military facility in the Southeast Asian state, a longtime U.S. ally, the development was quickly cast under the sensationalist narrative of growing Chinese inroads into Southeast Asia at America’s expense. Yet a year later, despite some progress in Sino-Thai defense ties, little has surfaced publicly about the operational reality of the project. Though some Sino-Thai military cooperation had already been ongoing before, it had deepened following the coup in May 2014 orchestrated by the current ruling junta led by Prime Minister Prayut Chan-o-cha amid a downturn in U.S.-Thai relations. While much of the focus has been on submarines, there have been other notable developments as well, including a first-ever joint air force exercise, planned purchases of tanks, and even discussions about a joint military production facility to advance defense industry cooperation (See: “When Will Thailand’s First China Submarine Arrive?“). News of such a military facility first broke publicly last year, when it was disclosed that Defense Minister Prawit Wongsuwan discussed the proposal of a facility to manufacture and repair armaments in Thailand during a meeting with his Chinese counterpart Chang Wanquan as part of his highly-publicized two-day visit to Beijing. As I had noted at the time, details were still vague about what exactly such a military facility would entail. 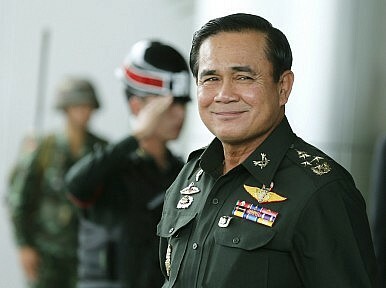 The broad outlines offered by Thai defense spokesman Khongcheep Tantrawanich had suggested that the facility be both a source of weapons parts and technology transfers to Thailand and a place to manufacture and repair armaments China supplies to Thailand and other countries in the region (See: “China, Thailand Mull Joint Military Production Facility”). Though it is not uncommon for maintenance facilities to be built as part of a more robust bilateral defense relationships, questions had been raised as to how this would progress in relation to the actual pace of defense cooperation as well as the extent to which this would be part of a more regional facility. Even before the idea had taken off, it had already been cast as part of a wider Chinese effort to strengthen its security role in Southeast Asia, a narrative that has a grain of truth in it to be sure but also tends to be exaggerated without due attention to lingering challenges Beijing faces as well as the gap between rhetoric and reality. Since then, China-Thailand cooperation has continued to progress, with visits and exchanges taking place and equipment transfers occurring as well (See: “Is Thailand Now Buying More Arms from China?”). Indeed, the first batch of Chinese tanks to Thailand had actually arrived in October ahead of schedule. China North Industries Corporation (NORINCO) has also been quietly expanding the scope of its collaboration with the RTA on defense trade and other areas as these transfers have been in the works within the context of broader bilateral ties. Yet for all this activity, we have actually heard quite little about the state of the facility itself publicly so far. In April, Thai defense officials had indicated that they had they had been looking into the idea and might be able to finalize the shape of plans by the middle of the year. But there were still key issues to be resolved, including where the facility would be located and what exactly its scope would be (descriptions had ranged from a basic repair and maintenance facility with some technology transfer to a factory that would be able to produce new equipment such as aircraft for export to other Southeast Asian states). Thai officials had also said that similar facilities were being considered with other countries as well such as Russia and Ukraine to emphasize that this was not just a unique arrangement between Bangkok and China. This week, we got a few additional specifics on what a facility might look like. Kongcheep, the defense spokesman, told Reuters that the Thai government’s Defense Technology Institute (DTI) would set up Thailand’s first joint defense facility with China in the northeastern province of Khon Kaen in July. The facility, Kongcheep reportedly said, would be responsible for assembly, production, and maintenance of Chinese weapons systems for the Thai military. But Kongcheep was still coy about the specific shape of the facility. He said that all production would be for “domestic official usage,” but then reportedly added that it could become a wider assembly and maintenance center for Southeast Asian states. That is consistent with the Thai official line that there would be an initial domestic focus despite an aspirational regional one that officials are quick to correctly point out that various powers, including the United States, have entertained dating back decades in Southeast Asia. He also unsurprisingly refused to disclose additional details about more sensitive aspects, including the deployment of Chinese personnel to the facility. All that suggests that despite all the chatter about the Sino-Thai military facility that has continued to reverberate over the past year, the rhetoric around the project itself is still significantly outstripping its operational reality. How that reality evolves into 2018 will continue to be a development worthy of close scrutiny beyond the sensationalist headlines.